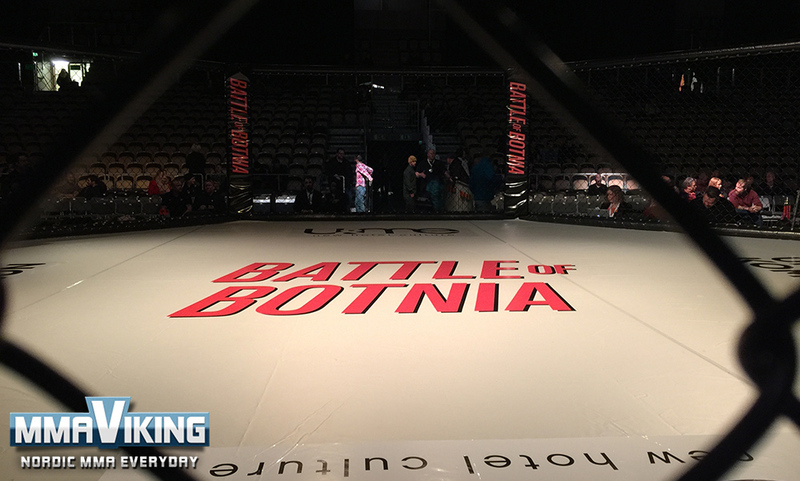 Battle of Botnia is back after a 4 year layoff, and MMAviking.com is cageside to cover the event in Umea. 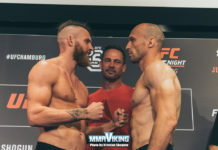 Niklas Bäckström from Lulea and the pro fighters from local Renyi fight team are featured on the card, along with Lina Akhtar from Malmo and Emil Meek from Norway. Check out live results below, and live pictures and interviews after the bout! See the full fight card here. Victor gets a huge pop walking in with his local crowd behind him. The Swede lands a good shot early, but his opponent is tall with a good reach. Victor’s eyes are wide open, and he is ready. The London fighter is confident, faking punches… and now a takedown from the visiting fighter, but Gustafsson is up. A body lock from Ekpo and a throw, but Gustafsson rolls him through and is on top. An illegal upkick from Ekpo and the fight is stopped briefly. Back to the feet, and both fighters throwing punches. 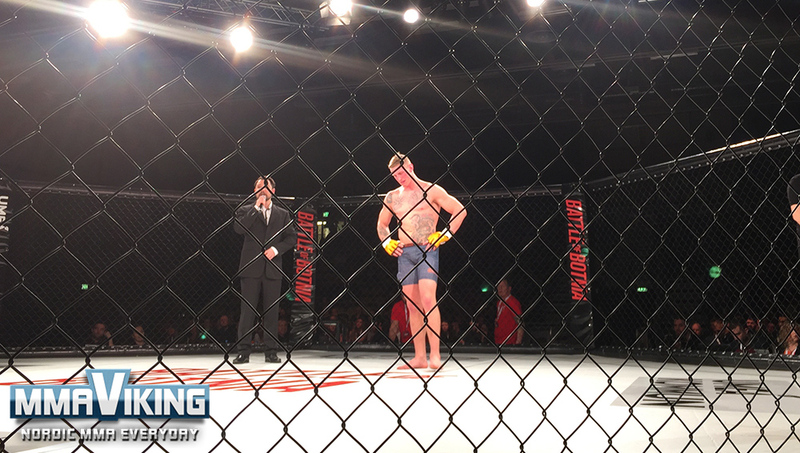 Solid punch from Viktor, but Ekpo takes the fight to the ground and is on top with the Swedes back to the cage. One minute left. Gustafsson gives up his back and tries to stand up, and he is there… but only in time to end the round. A close round 1. Ekpo is so relaxed on his feet, but Viktor is stalking his opponent, looping for looping punches coming in. A few misses from Viktor, then a nice right kick to the body. Then an immediate takedown from Ekpo that is showing good takedown skills. The crowd is cheering on their man, but with 2 minutes left he is on the mat. The Swede is almost up, but gets hip tossed high in the air and lands on his back. Viktor fights and scrambles, and now is on his feet. One minute left, and a high kick lands on the face of the UK fighter, but is blocked with a hand. Solid body shot with a kick to end the round for Ekpo. Ekpo got that one. Solid frontkick to the face of Gustafsson, and a nice follow-up straight hand. 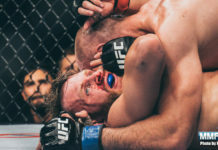 Ekpo must have Anderson Silva as one of his favorite fighters as he emulates his style, which leaves him open for a Chris Wiedman KO punch if he isn’t prepared. 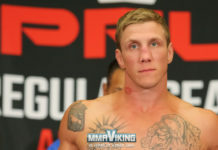 Gustafsson can’t find his way to the chin of the visiting fighter, and he is now bloodied. A foot shuffle from Ekpo, but nothing really happening. NO fighter pulling the trigger and less than two minutes left. Another front kick that lands in the face again. One minute. Ekpo is playing and almost on his knee. BIG KNEE FROM GUSTAFSSON TO THE FACE AND EPKO IS HURT. HE FALLS DOWN AND THE SWEDE TAKES FULL MOUNT….. but time runs out!!!! Ekpo wins by unanimous decision. Flores gets the local fighter applause, and the two start out slow on the feet. 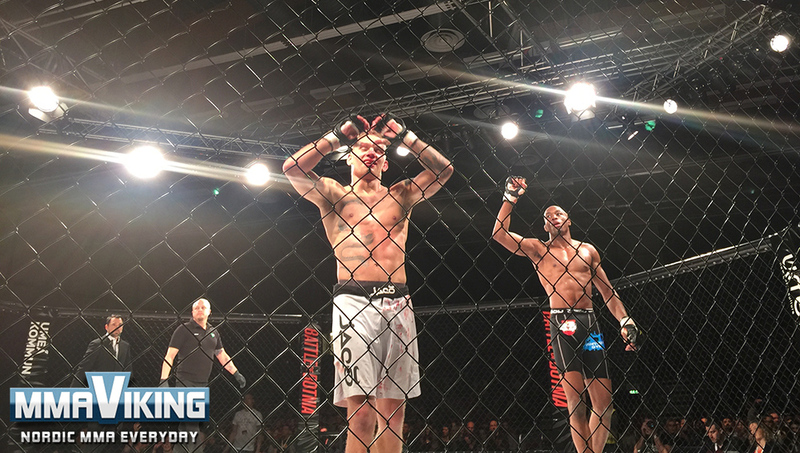 Seguy shows he can get the fight to the ground with a nice takedown early, and he stays in control and top. El Toro can’t find his way off his back, with the French fighter in half mount. Full guard now. Two minutes left, and both fighters to the feet. Flores is looking for big punches, and now lands a good low kick. In the exchange, Seguy again gets a takedown. One minute left. Flores rolls for an armbar, but can’t get it. A different energy from Flores now as he comes out. 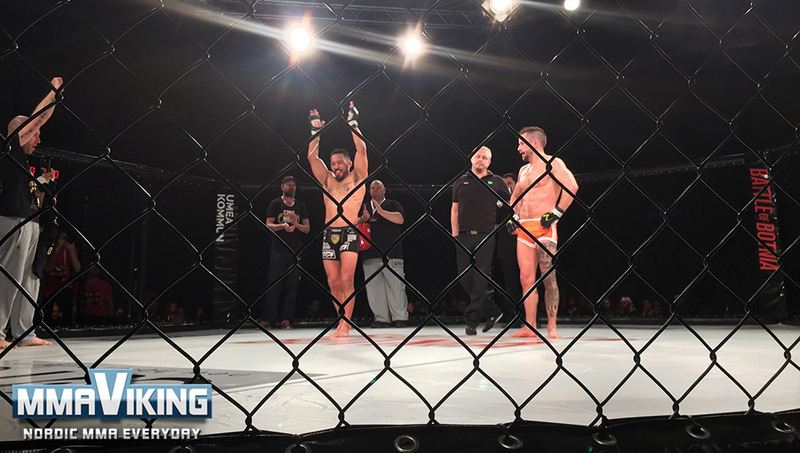 Flores gets a headlock as Seguy shoots in for another takedown, but the local fighter is in control now. Knees to the side with the headlock still tight! A front roll into an anaconda choke. It is tight… and the top. The crowd goes nuts!!! The fight starts, and a left kick to the leg or was it in the groin? Either way Gritko is on the ground in pain, and this is not looking good. He can’t get up, and lays on his back where they are applying ice packs on his parts. Only 19 seconds have ticked off the clock. And Gritko can’t continue. This bout is a No Contest. Back defends a takedown early and looks for a guillotine, but can’t quite get it. Khampasath squeezes Back against the cage and lands some punches. One minute left, but nowhere for Back to go. Not much of a round there, but it will go to the visiting fighter. And, the bout goes back to the ground with Back on his back. A little ground and pound here and there, but nothing too damaging here. The fight is more than half over now. Full guard from Back, so he won’t be going anywhere unless the bout is stood up from the referee. Back has trimmed his beard and hair, I preferred the full lumberjack look he had back in February. The Renyi fighter a bit more active here, landing a kick. But, it is Khampasath in on the legs again… but now it is Back with a TIGHT guillotine… and he is squeezing it. Hard to tell how tight it is, but Back thinks he can finish with it. The head pops out, and the visiting fighter is safe. Two minutes left. One minute left, with little to no action. Back needs to make a move if he wants to change things here, and he does. Pops his head out and is on top for the first time. Half guard, he is landing some punches. 10 seconds left, and Back lands a few punches to the body. Meek comes out to a huge applause, and the Norwegians have traveled well for Valhalla. Djck is being cornered by Allstars Training Center’s Jonatan Westin and Coach Andreas Michael. Djck wants a takedown, but Meek defends well. Both exchanging punches early, and this looks like it will be a good one. HUGE right hand from the Christophe that was crushing. Meek goes to his back to recover. Valhalla avoids getting full mounted, but Djck takes side mount and just looks heavy in that position. 90 seconds left, and Meek is struggling to get off his back. Armbar attempt and a siscor of Meeks face and this could be over! Meek fights and fights, and he is out and up on his feet. The place is going nuts! 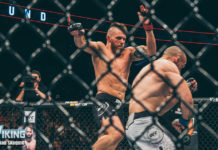 Valhalla lands a solid right headkick to help turn things around. Now a flying knee, that barely misses the mark as Djck shoots in for the legs. Round one to Djck… we got a good one here! Meek goes for another big right kick, but missed this time. Djck trying to get the fight to the ground, but Meek defends well. What a pace we have here, and both fighters seem well conditioned. A high left kick from Meek. Another sprawl from Meek to defend the take-down. The Swedes have adopted Meek, and start cheering in Swedish “PUnch him in the face.” Meek starts to pump his left hand and lands the jab. Meek is turning this fight around, but now Djck lands a monster uppercut with the right and now goes for a take-down again. Meek defends the take-down and now gets back an landing punches BIG punches, and MORE PUNCHES. Djck escapes, but Meek keeps his head to the mat and punches him more and more and more, and THIS IS OVER!!! Pudilova wants this fight to go the the floor, but Lina defends it well. The body types are very similar here and no advantage so far. Pudilova trying to land some knees. The pace pics up here, but no girl with a real advantage yet. Wow, nice elbow on the break from Länsberg as her opponent has her back to the cage. Wow, left kick to the face that makes a slapping sound that rings through the Energi Arena. A real competitive first two minutes, with both fighters trying to find their advantage. It is now Lina that initiates the clinch and lands knees. Another knee to the body, and Pudilova looks a bit discouraged as the fight is broken up. Lina beginning to bully the visiting fighter. Big right elbow from the outside, and we are all Dirty South here. Well matched fight here. Lina keeps her chin down, looking for a high-kick. Lina catches a kick, and could bring it to the ground… but opts top push it against the fence. Martin is the only person in Lina’s corner, and he likes what he sees as Lina lands a few nice three punch combinations. Nice left jab and all Akhtar here. Lina catches the leg, and pushes Pudilova to the fence. Pudilova tries to throw Lina, but Lina pushes her to the fence. Both fighters are tired, but only 20 seconds left now. The Swed should be getting this one, but they fight to the end here in Umea. Both fighters look crisp early, but David lands some nice kicks that the local crowd enjoys. A takedown attempt from Häggström, but Hartsner defends it. Odd seeing two well known Swedes fighting, and I am confused when a few people in the crowd root for Sverige. Emil comes out off the break with a nice kick, but David responds. Häggström looks real quick and crafty with his kicks, but it is Emil now that catches a kick and gets it to the ground. Hartsner gets side mount, but David recovers. Less than two minutes left, and Emil tries for full mount, but David scoots under. Harstner with a guillotine attempt, but lets go. Back to the feet, and David comes storming in. Quality fight here. Knee and elbow, and another knee for Harstner here late. Close first round. David early, Emil late. Fireworks from both that punch high, and kick low in the first 30 seconds. No fighter backing down here. Good straight right from Emil. Blood on Emil’s lip, and Emil is kicking high and low. Flying knee from the Frontier fighter. David is pushing the former TUF fighter against the cage, and lands some inside knees. David lands an overhand, and the crowd cheers. Left kick to the body from David and it must have hurt. Two minutes left. Coach Andreas asks his fighter (Harsner) for a takedown, and now only 50 seconds to go. Hartsner almost gets the takedown with a hip toss, but David defends. Another knee from Harstner, and the Malmo gets the takedown at the end of the second to get that round. The two touch gloves. Emil is pushing the action now, and you can feel the momentum turn. Hartsner gets it to the ground and sits in side mount. Knee on belly. Now he takes back, and a neck crank… nearing a rear naked choke. It is tight! David defense is weakening, and now it is over. 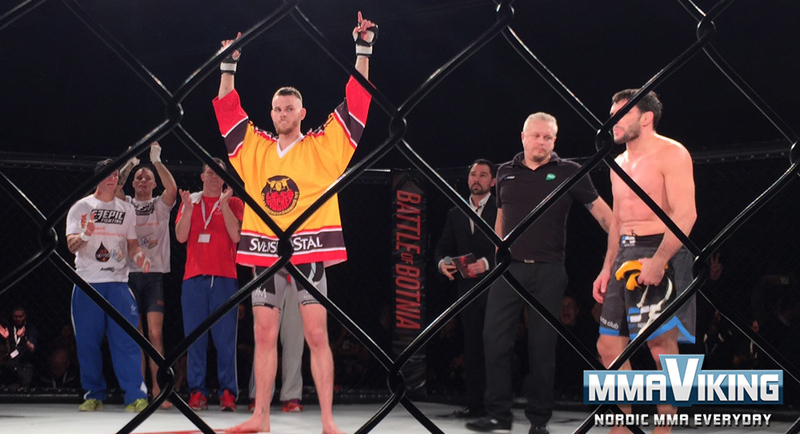 Winner by submission is Emil Hartsner. 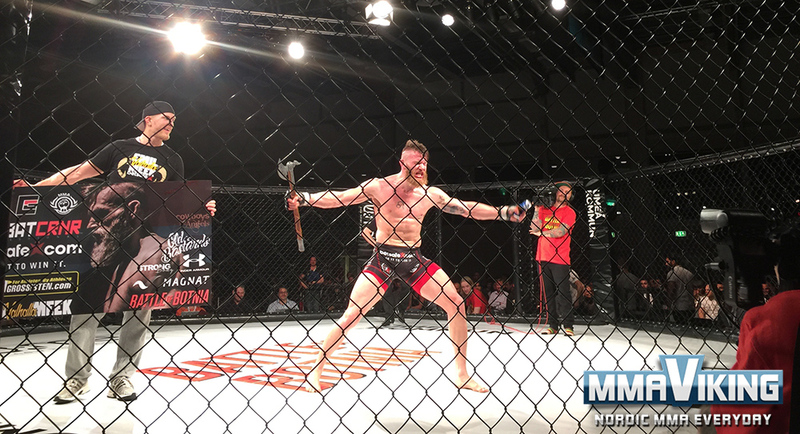 Hartsner wins by RNC submission. Bäckström takes his time, but lands a head kick. The Swede is in control in the center, and lands another front face kick. Stoyanov dives in on a leg, but Bäckström counters and now is in the guard. Stoyanov looks relaxed on his back, and dives for a knee… seems he may have some tricks in his bag, but Niklas is now in control. He gets back and now looks for a rear-naked choke. He squeezes, and it is over! 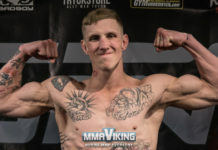 Bäckström wins by RNC in first round. 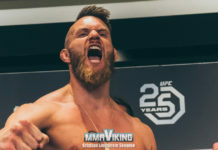 Pictures and interviews coming to the www.mmaviking.com over the next few days!